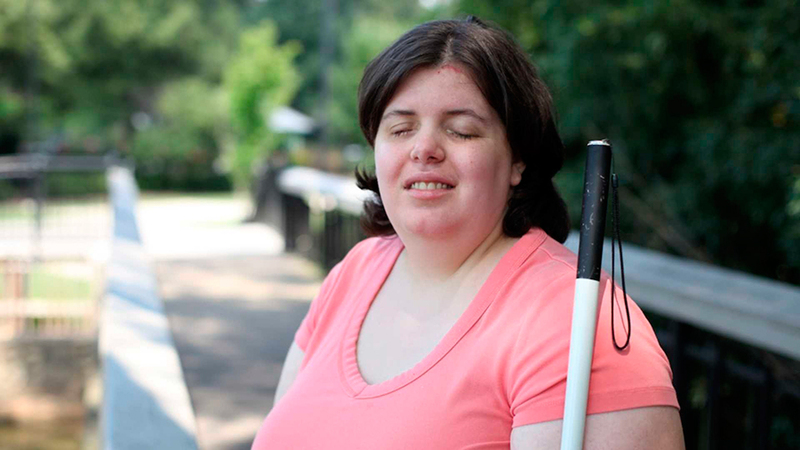 North Carolina – A 30-year old woman named Jewel Shuping, has accomplished her life-long dream of being blind by arranging with her psychologist to pour drain cleaner into her eyes. Jewel has being diagnosed with something the scientists call Body Integrity Identity Disorder (BIID), a disease that drives a person to believe they are meant to be disabled, and in this case, made Shuping believe that she was supposed to have been born blind, according to The Daily Mail. She suffered this condition since she was a child when she spent hours staring at the sun after her mother told her it would damage her eyes. “My mother would find me walking the halls at night, when I was three or four years old […] By the time I was six I remember that thinking about being blind made me feel comfortable,” she told The Mirror. As a teenager, she wore black thick sunglasses and a cane just at the age of 18. By the time she turned 20, she was already fluent in braille. “I was blind simming, which is pretending to be blind, but the idea kept coming up in my head and by the time I was 21 it was a non-stop alarm that was going off,” she said to the Daily Mail. To fulfill her dream, Jewel find a psychologist willing to help her and had a mix of eye drops and drain cleaner poured into her eyes to become blind. The psychologist remains anonymous and it is unknown if he could charge for his actions. She admitted the process was incredibly painful. “My eyes were screaming and I had some drain cleaner going down my cheek burning my skin. But all I could think was ‘I am going blind, it is going to be okay’,” she declared. Doctors at a hospital tried to save her vision, against her wishes, but they were permanently damaged. She experienced “corneal meltdown” on the left eye, collapsing in on itself and requiring the eye to be removed, while her right eye had glaucoma, cataracts, and a webbing of scars all as a result of her actions. It took about six months for the damage to fully take effect but eventually her eyes lost all function. Ms. Shuping’s family has cut contact with her after learning it wasn’t an accident but she still has support from her former fiancé Mike, 50, who is registered legally blind due to naturally occurring early-onset macular degeneration. According to BIID.org, Body Integrity Identity Disorder is when a person’s idea of how they should look does not match their physical form. The condition is very rare and it usually manifests in a desire to have certain body part amputee. Usually, the limb that the person would like to remove is actually healthy and in the most severe cases, a person with BIID may do bodily harm to what that they would like to have removed, to necessitate an operation. Others manage to cope with the illness by using canes and prosthetic attachments to help them feel complete.